The pic above depicts a veritable "feeding frenzy" of piscivorous birds during feeding time at the Berlin Zoo. It highlights some of the variety of forms fish eating birds assume today- diving pursuit predators like cormorants, stalking waders like herons, surface gleaners like gulls- to name a few. One does not have to go far to find fish eating birds. Even here in southern California, an area not known for its water resources, I know of a colony of black crowned night herons within walking distance, have spotted an osprey that visits local golf ponds, and can generally find great blue herons stalking any type of habitat- from roadside ditches and vacant lots to backyard gold fish ponds. And that is not even counting ocean birds. Within ten minutes of time spent at the local Santa Clara river mouth I can spot up to two types of terns, brown pelicans, cormorants, several types of gulls, and any number of rarer, migratory types. Clearly with this type of diversity in a relatively urban setting fish eating as a lifestyle for derived avian theropods (i.e. "birds") seems to be working out splendidly. And this modern success of theropods as fish eaters hints at an extended legacy of unbroken success as predators of aquatic life that dates back at least until the Triassic, and quite possibly to the dawn of dinosaurs. And it is this ability to exploit aquatic prey (especially as a "fallback resource"), I will argue, that allowed nonavian theropods to maintain relatively inflated numbers compared to herbivorous dinosaurs- above and beyond the predator prey ratios we see with modern mammals. 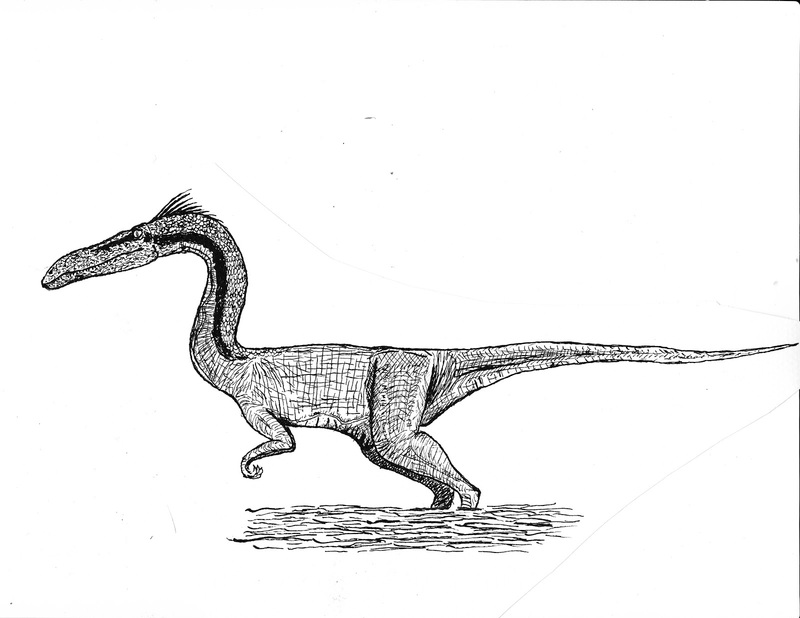 Coelophysis, one of the earliest known theropods from good remains- but also one that effectively sets in stone the basic blueprint from which all future theropods will be based upon- from Torvosaurus to T-Rex. 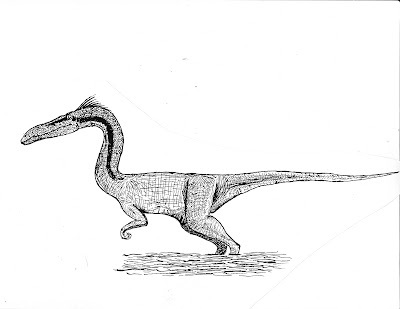 The Coelophysis body plan, minus long torso and tail, was again co-opted and put to use with startling efficacy by predatory wading birds- herons. Notice the Heron separates a pair of mating frogs- who says feathered dinos are weak? Again notice how it is the combination of the mobile long neck combined with the upright bipedal stance that are the crucial elements of the herons' predatory strike- both of which were there right from the beginning with Coelophysis. 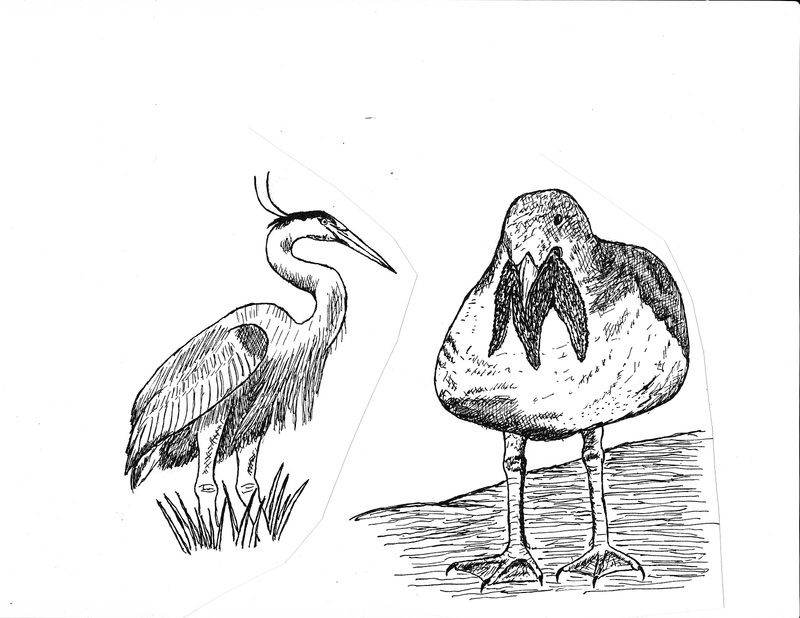 Which leads me to a very important point, ALL predatory non-avian theropods were, on account of the conservative theropod bauplan, somewhat pre-adapted to a style of hunting conducive to heron style fish capture. Perhaps, not as good as a heron, but certainly better than something like a wolf- which despite minimal fish catching adaptations- does make a go at salmon quite commonly in some populations. So all predatory theropods, with their vertical height and view and rapid fire necks were already adapted as aquatic heron type predators and could fall back on this resource if other prey was lacking. Again, let me reiterate, the theropod design maximizes flexibility- certainly some species hunted waters more than others- but if push comes to shove, like the wolf above all predaceous theropods would have had some capacity as fishers. And keep in mind herons are excellent terrestrial stalkers as well, in fact I would not be surprised if the herons that live around me eat more rodents than fish. Theropods would have probably been much the same- in fact opportunism and generalist hunting strategies seem to be hallmarks of large crocodiles, herons, and birds of prey- all of which are archosaur relatives to dinosaurs. Starting in the Triassic things were a little "tight" ecologically speaking for predaceous dinos. Of course you have a whole variety of prey items in the form of diverse and weird therapsids, reptiles, archosaurs, protodinosaur etc etc. But theropods were essentially "hemmed in" ecologically speaking by phytosaurs, big croc analogues in the waters, and on land rauisuchids, big knarly, macropredatory crurotarsian archosaurs. Although various theropods were diversifying and in some areas becoming quite common, rauisuchids had the megapredatory niche on lock down and were not giving an inch to theropods- which did not get above lion sized for the most part. Fasolasuchus tenax was the T-rex of the rauisuchids from the latest Triassic of Argentina. This 10 meter long beast was, at the time, the largest terrestrial predator the world had seen and held sway over a transitional fauna (Los Colorados Formation) which contained at least 3 prosauropod species. This neglected species was, in a sense, the first brontophagist. To say world ecosystems experienced a "hiccup" ecologically speaking at the Triassic/Jurassic boundary is putting it mildly- whatever the case phytosaurs and rauisuchids were gone so party times for theropods right? Well a growing body of evidence is suggesting all groups were impoverished, including dinos, after the extinction. 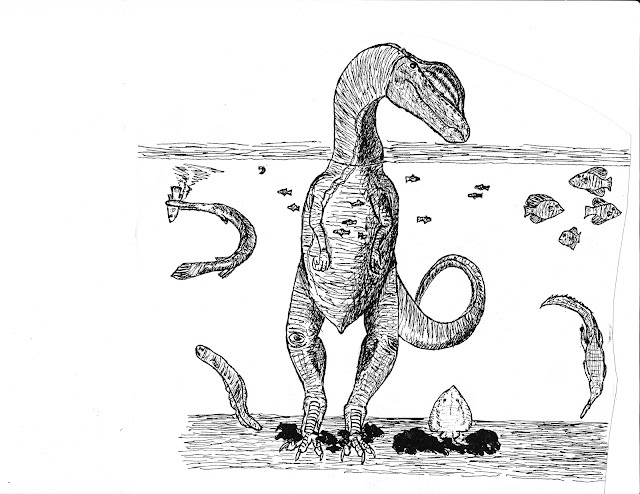 Here is a link to a bunch of abstracts from a conference detailing the poorly recorded transition from the Triassic to the Jurassic. Now I don't want to get bogged down in the minutiae from all these abstracts but here are some of the main points. 1) Diversity levels were low and ecosystems not particularly robust at the transition period. 2) Theropods, terrestrial crocs and pterosaurs were ubiquitous and sometimes common, herbivorous dinosaurs, not so common. 3) A nearly worldwide phenomena of Eubrontes and Grallator footprints, with few other species, characterize this time period. Now keep in mind that Eubrontes and Grallator are not species actually preserved by fossils per se but by footprints, ichnospecies recorded in lacustrine environments. Eubrontes is almost certainly Dilophosaurus while Grallator is perhaps Megapnosaurus or some coelophysid type. you should be starting to see the pattern- whenever I have a whole mess of "terrestrial predators" but seemingly very few herbivores- maybe, just maybe, they are exploiting aquatic resources. And this is exactly the conclusion several of the authors reached in the Triassic-Jurassic conference abstracts I mentioned above. Several authors noted that crocs at the time were small little terrestrial buggers, even after they invaded water habitats they remained fairly small until well into the Cretaceous when we get guys like Sarchosuchus battling it out with spinosaurs for top freshwater predator. So they take it one step further, and justifiably so imo, suggesting theropods exploited near shore aquatic niches throughout the Jurassic- culminating in spinosaurids into the Cretaceous. Various other guys, the family Unenlaginnae for example, may have become fish catching specialists as well. 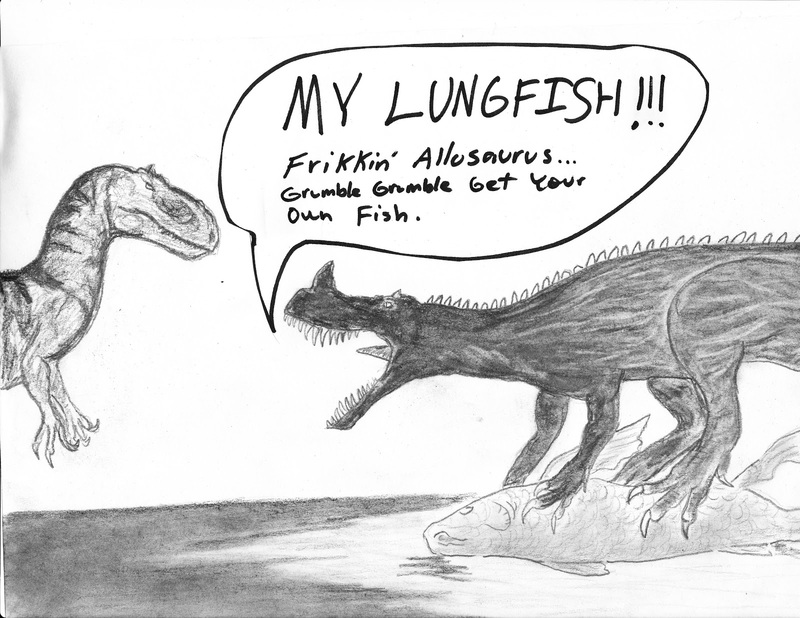 But lets not lose sight of the fact that all predaceous theropods had some capacity as fish hunters. And it was likely this dual functionality- hunting on land and in the water- that was key to theropod success in the Mesozoic. And it was this versatility and generalist tendency, there from the beginning, that allowed theropods to live in such numbers and diversity which kept the dinosaurian herbivores at bay (either through visual presence or actual predation) and therefore helped vegetation from being overly browsed. 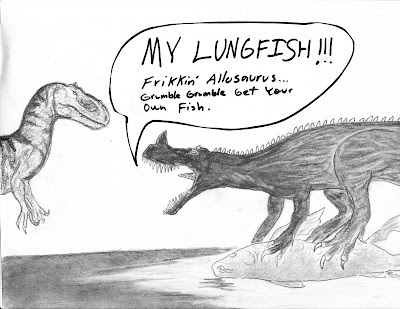 Juvenile Allosaurus and adult Ceratosaurus in lungfish dispute. Although he got a lot of heat for it I actually like Bakker's paper on theropod family values- I just disagree to the extent ceratosaurus was a fish eater. Dilophosaurus fishing/wading. I remember spilling ink by its feet and trying to make it look like stirred mud.